Do you like card games for crowds? Do you like games with shifting-roles? Do you like manipulating a game in order to straight-up kill your friends? 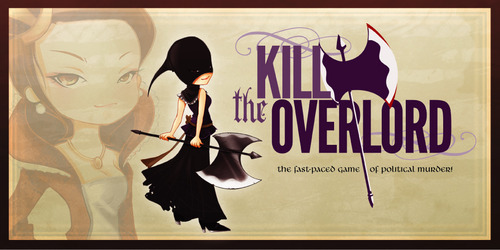 Kill The Overlord, by APE Games, gives you the chance to do just that in a take-that game for 4 to 8 players. 16 character role cards (two sets of 8)—These are oversized cards that are double-sided. They have a male character on one side, and a female on the other. Functionally, they’re identical, but it’s a nice touch to think of the women gamers (admittedly a minority) who might want to have a matching character. The artwork is done in a sort of anime style. 1 execution order card—This is the same size as the character cards; it gets passed around a lot. 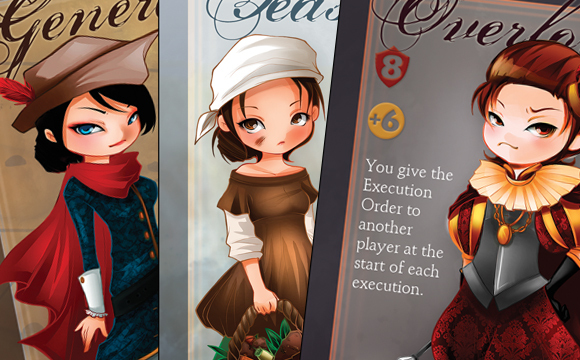 44 plot cards—These are normal-sized cards that let you do things, such as give the Execution Card to someone else, or take the Execution Card yourself, and many others. Gold tokens—Punchboard money in denominations of 1’s and 5’s. They do just what they’re supposed to do. Elimination Tokens, numbered 1 through 8—Punchboard tokens. So the game starts with you taking a number of character cards—this will always include the Overlord card, and then the others will vary depending on numbers of players. The game comes with two full sets of character cards—8 “basic” ones and 8 “advanced” ones. You can mix and match them however you’d like. 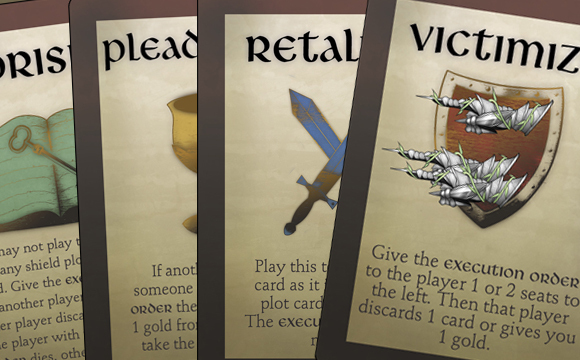 Each card has the character’s name, a number in a shield, an amount of gold that character gets each turn, a description of that character’s special power, and then the picture of the character. For example, the Squire, who is ranked #3, gets one gold per round, and his special power is that his hand size is increased by two and he gets to draw a card at the start of every execution. (He’s one of my favorite characters…) The Captain is ranked #5, gets three gold per round, and when you give the Execution Order to a player, that player has to discard a plot card if able. You deal out the roles and give everyone 5 gold. The first thing you do is draw up to two plot cards, up to your maximum hand size, which is four unless you have something that changes that. Then you collect income (skipped on the first turn since you already have money). The higher ranked your Character Card, the more money you’ll collect—up to 6 if you’re the Overlord! Next comes the Coronation phase, which is just a simple check to see if the person who is currently the Overlord has 30 gold. If so, that person automatically wins. Then we have the Executions phase—this is when most of the game’s action takes place. The Overlord chooses a character to take the Execution Order. The game makes this distinction because there are a number of plot cards and character special powers where something happens when you give the card to another player. But here, the Overlord is choosing someone to take the card—not give. It’s a little hard to explain at first, but soon everyone gets what you’re going for in the distinction. The player who gets the Order then tries to give it to someone else—generally through the play of a plot card. People keep playing cards and passing the Execution Order around until someone gets it who doesn’t have any way to ditch it. That player is “executed” and out of the round—he or she puts their character card into the middle of the table and takes the lowest-available Elimination Token. This continues until the Overlord is eliminated this way, which ends the round—and yes, it can happen that the Overlord is the first person killed. Once that happens, there are a few steps that determines how the character cards are distributed for the next round. Now in descending rank order, any other players still alive do the same thing. Finally, any players eliminated in the round take new characters in the same way—except now you go in order from the lowest-numbered Elimination Token up to the highest. So the first person eliminated in a round will end up with the lowest-ranked character card for the next round. You shuffle all used and unused plot cards together and play another round. As we said before, anyone with 30 gold and the Overlord card will win. Another way to win is to be the Overlord and be the last person executed in a round. If that happens, you automatically win—though this won’t happen often as the other players will work together to make sure the Overlord isn’t the last person left alive. Youth Group Game? Yes! This is light enough—and accommodates enough people—that it would work well as a youth group game. Family Game? Sort of! Not with our young kids, but surely when they’re older. They’ll need to invite friends over, though, as this is better with more. Gamer’s Game? Maybe! If your group loves lighter, take-that games, this is just the ticket. If your group likes deeper games, this can fit in as a filler—though it’s a bit long for a filler. Firestone—I’ll be honest. No one in my group normally likes these type of games. But every single person (other than one guy who wasn’t feeling well) thought it was really good “for what it is.” That sounds like damning with faint praise, but for a group of people predisposed to dislike a game, the fact that we all enjoyed it says something. Jeremiah— There are folks I game with who really enjoyed this game; it fell right in their wheelhouse. I too enjoyed the game, but could see how it may not be for everyone. Firestone—The components are good, especially for the price-point. One small complaint about the plot cards: There are gauntlets on these pointing in different directions to help you figure out who exactly would be affected by you playing the card. Unfortunately, the drawing of the gauntlets is super-stylized, and most people at the table (myself included) had no earthly what they were. Once someone pointed it out, it was obvious, and you realize that’s really helpful. But this was definitely a case of choosing form over function, IMHO. Jeremiah—I thought the components were well made. I enjoyed the stylized look and detail of the character cards. The male/female option is a nice touch, although some of my group noted that the anime style in which they were drawn made some of the characters look rather androgynous. But fortunately this is a purely cosmetic function of the components, and has no bearing on the gameplay itself. We also had a few folks who didn’t realize that the plot cards had gauntlets on them. Jeremiah—I guess I would describe the game play as “light-hearted cutthroat”. If you’re the Overlord for a round, you can be sure that everyone else is going to gang up on you, but that’s okay because you’ll be ganging up on the new Overlord in the next round. It’s light-hearted in that you can have a pretty good time playing it and killing off your friends without investing a lot of brainpower into strategizing your moves. Which isn’t to say there aren’t advantages to having a few (albeit loose) strategies. Firestone—Light-hearted cutthroat is a great way to describe it. Yes, you’re trying to kill everyone, but oddly enough it doesn’t feel mean-spirited. The end game is interesting. In our game, many people had enough gold to win, so everyone was working to keep those three people from getting the Overlord card. That can be hard to do, since you can only work with the plot cards you have. One of the reasons we liked this particular version of this particular type of game was that it did feel as though you have some control over what happens. It’s certainly not all luck. Jeremiah—The plot cards act as a good equalizer. You can have a great character role for a round but if your hand isn’t that great you’ll probably get picked on by the Overlord until you are executed. It’s important to note, that everyone starts with 4 cards. And certain roles can draw up to a higher hand limit when the time comes. We weren’t too clear on that from the instructions, but a quick search on the interwebs cleared it up for us. Firestone—My biggest complaint with the game was that it had some “Kill Dr. Lucky Syndrome”—which means that if player A is about to win, then player B has to stop that from happening. But if player B does that, he weakens his position, leaving the door open for player C to end up winning. I’m not a fan of that AT ALL, but this didn’t seem as bad—possibly because you’re not going strictly in seating order, but rather in rank order. Jeremiah—Final thoughts and ratings: If you’ve read any amount of our reviews, you know that I’m a fan of games that involve lots of cutthroat, competitive, out-smart-the-game-AND-the-other-players elements. And this has a good deal of all of that. There are tons of characters so the replay-ability with the different combinations of characters is pretty high, and I like games that a gathering of 6-8 people can all sit down and play together. I’m giving it a solid 8 overall, for the different groups of folks that I play games with it hits a pretty wide audience. Firestone—Final thoughts and ratings: This feels like a 7 to me. I like the variable characters, and extra characters, and I felt I had interesting decisions to make. I’ll probably keep it in my bin for a while for game nights, and I think we’ll pull this out when we need a filler. Will it be there 6 months from now? Not sure. It’ll definitely stay in my pile of games to play with youth group or in “party” situations. We’d like to thank APE Games for furnishing us with copies of Kill the Overlord for this review. Please check them out! And as always we ask that you spread the social media love, by liking our FaceBook page, and following us on Twitter!